Rep. Adam Schiff, wielding his new power as chair of the House Intelligence Committee, said he plans to launch a wide-ranging new investigation into President Donald Trump and his “family” with a focus on alleged money laundering. Schiff, a vocal proponent of the unsubstantiated anti-Trump dossier funded by the Clinton campaign and authored by Christopher Steele, “wants to show that Trump is a foreign agent who puts money over country,” Rowan Scarborough wrote in an analysis for The Washington Times on Feb. 10. Schiff on Feb. 6 said he plans to investigate Trump the businessman, candidate and president. The California Democrat seeks all information on the Trump Organization’s real estate deals and its discussions with foreigners (which conceivably could go back four decades). “In total, what began in January 2017 as a look at any election coordination between Russia and the Trump campaign is now Schiff’s exploration into the billionaire’s adult life,” Scarborough wrote. Schiff’s “scope is so wide open that staffers say they can’t remember a House or Senate intelligence committee ever embarking on such a mission,” Scarborough noted. The use of the word “family” by Schiff can be interpreted as including his sons, daughters and first lady Melania Trump. As he did in the 2017 investigation, Schiff prior to launching the new probe is leveling unsubstantiated charges against Trump, Scarborough noted. In the 2017 probe, Schiff repeatedly cited the unverified dossier. “The public didn’t know at the time that the dossier was actually opposition research on Trump paid for by the Hillary Clinton presidential campaign and the Democratic National Committee,” Scarborough noted. On March 20, 2017, then-committee chair Rep. Devin Nunes convened a televised session with then-FBI Director James B. Comey and then-National Security Agency Director Adm. Michael S. Rogers. Reading from the dossier, Schiff said Carter Page, a Trump campaign volunteer, while in Moscow for a public speech, met with two senior associates of Russian President Vladimir Putin. Page discussed receiving bribes in return for pushing sanctions relief. Page repeatedly has denied to the FBI and Congress ever meeting the men. He has filed several lawsuits in an effort to clear his name. He has not been charged with any offense by special counsel Robert Mueller. The Trump campaign gave Moscow documents damaging to Hillary Clinton that would be published in WikiLeaks. There has been no public evidence supporting this charge. U.S. intelligence says WikiLeaks received stolen Democratic Party emails from Russian hackers. Paul Manafort, one of several Trump campaign managers, teamed up with Page to coordinate Russian hacking. There has been no public evidence that the two knew each other or ever talked. Manafort has been convicted of tax and bank fraud, but he has not been charged with any offense directly related to the election. Trump people did Russia’s bidding by “removing a section that supports the provision of lethal defensive weapons to Ukraine, an action that would be contrary to Russian interests.” The amendment to which Schiff referred was never in the platform at the 2016 Republican National Convention. During drafting, a single delegate offered the lethal aid language. Trump advisers decided it would be too strong a commitment before taking office. So the Ukraine language was changed to a promise to provide aid the Ukraine armed forces. The Ukraine language ended up stronger. The Trump administration did opt to send lethal aid in the form of anti-armor missiles to fight pro-Russian forces. 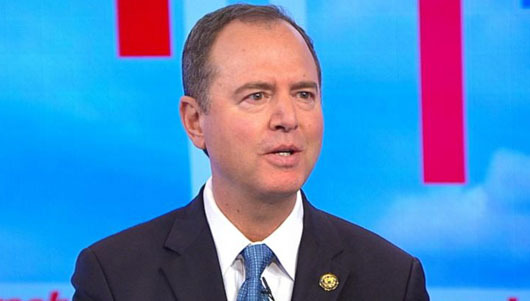 Schiff used the word “coincidence” several times as he listed contacts between a Trump person and a Russian, such as the Russian ambassador attending the GOP convention or conducting phone calls with retired Army Lt. Gen. Michael Flynn during the presidential transition. “Is it possible that all of these events and reports are completely unrelated and nothing more than an entirely unhappy coincidence?” Schiff said. “Yes, it is possible. But it is also possible, maybe more than possible, that they are not coincidental, not disconnected and not unrelated.” The Russian ambassador was part of a group of about 50 foreign diplomats sponsored by the Obama State Department to attend the convention.